I read Tales of Accidental Genius during the Christmas season, so I kind of forgot what it was about. I did tell everyone on Twitter to read it, because it's great. It's like a warm hug. Okay, so a few things are coming back to me now. I loved the story of the pet store cashier who helps an old man with his "sick" fish. That was so charming. The story of the retired body guard had the right amount of hopefulness. I was less enamored with the tale of the rich couple on their anniversary. It felt distant to me. 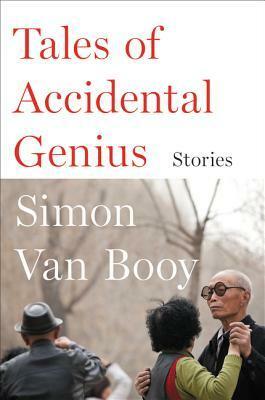 A feeling I'm not used to when reading Simon Van Booy's books. Maybe it was their elegant New York lifestyle that put me off. The last and longest story is different from anything I've read of his. It's a story within a story. It begins with a successful Chinese action movie writer. He takes a working vacation to write his next script. He's decided to write something completely different. A romantic movie. The real story is the one he writes. It's the life story of a vegetable vendor who grows up, loses his parents, falls in love with a girl, loses the girl, then becomes a millionaire and saves the world. What's so clever about the last story is that by making the tale a movie, anything is possible. Ghosts tell people what to do. Sure, why not? An invention solves the energy crisis. Of course! There are crazy coincidences, but whenever I had doubts, I remembered it's just a movie. Those things can happen in a movie. In each of these stories, strangers touch the lives of the characters in meaningful ways. Some don't even know how they've affected others. It made me think about how we are all connected, which is just the thing to read at that time of year. Thanks to Harper Perennial for the review copy. All opinions are my own. Everyone I know loves Van Booy's work but I haven't read any of it yet. I have no excuse either, because I own several of his books. You should read him. He's so good! I hadn't thought about the last story in that way --"by making the tale a movie, anything is possible." Terrific review. I love Van Booy. I end up taking forever reading his stories though because i end up rereading line after line just because they are so beautifully written. Oh hey! Here I Am!